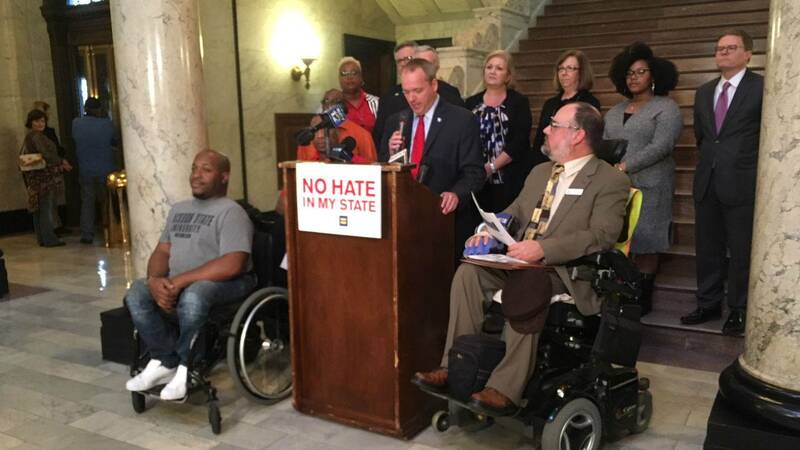 Mississippi advocates for the disabled and Lesbian, Gay, Bi-Sexual and Transgender communities are calling on legislators to expand the state's hate crime law. The Human Rights Campaign of Mississippi is leading an effort to expand the state's hate crimes law. Rob Hill is with the organization. He and supporters talked about the issue at the capitol. They want legislation that mirrors the federal hate crimes law, which stiffens penalties for crimes targeting people because of their disability, sexual orientation or gender identity. "The LGBTQ community or people with disabilities if they are targeted then it can be prosecuted as a state hate crimes law without waiting for the federal government to get involved and prosecute," said Hill. Mississippi's current hate crimes law provides stronger sentences for crimes against someone because of their perceived race, color, ancestry, ethnicity, religion, national origin or gender. Hills says there is a bill in the House and one in the Senate in support of the change. He says the legislation has bi-partisan support. House Democrat David Blount of Jackson. "Mississippi has made a lot of progress but we still have a long way to go. This bill is a step toward progress," said Blount. On the Senate side, two committees are reviewing the proposed legislation, Judiciary A and Corrections. Republican Senator Briggs Hobson of Vicksburg, chairs the Judiciary A Committee. "I think it's got a good chance of coming out of committee. I think some people are working on vote counts within the Senate and the House to make sure there are enough votes to get it passed," said Hobson. The deadline for the bills to be passed out of the House and Senate committees is today.